The first season of the new Chinese singing competition Sing! China <中国新歌声> premiered on Zhenjiang TV on Friday, July 15. The show, a rebranded version of The Voice of China <中国好声音>, features singers Jay Chou (周杰伦), Na Ying (那英), Wang Feng (汪峰) and Harlem Yu (庾澄庆) as a panel of four vocal coaches who critique and personally train their own team of new artists. The four coaches dominated the opening stage of Sing! China, performing each other’s songs. Na Ying sang Harlem Yu’s “Only for You” <只有为你> and Harlem performed a rock rendition of Na Ying’s “No Matter How Difficult” <不管有多苦>. Wang Feng did a memorable performance of Jay Chou’s “Silence” <安静>, while Jay performed Wang Feng’s “Full” <满>. The competition is formatted into three different stages: a blind audition, a battle phase, and a live performance stage. 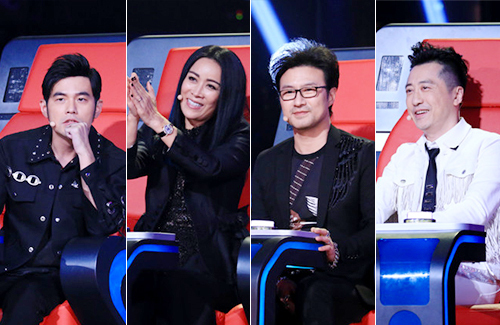 In the first episode, the four coaches are asked to select their own team of trainees through the blind audition phase. It was a friendly competition between the four coaches as well, and the four vocal teachers would always jokingly attack each other whenever given the chance. Jay: Many people listen to my songs to practice Chinese. Harlem: But you can’t even sing clearly! Na Ying: My kids had a hard time trying to understand what he was singing in that song, ‘Tornado’ . That is so funny but so true when they made fun of Jay! So true. But he still slayed them all. He has luck and talent.